Sooty mould does not attack the cannabis plant; it feeds off the poop from sap-sucking insects. If you have sooty mould, you have a severe bug infestation. Learn how to deal with it. Soot is the name given to the black, flaky substance that forms when organic matter burns incompletely. If you’ve ever seen black smoke from a chimney, certain stains on old buildings, or that black buildup in a fireplace—all of these are soot. 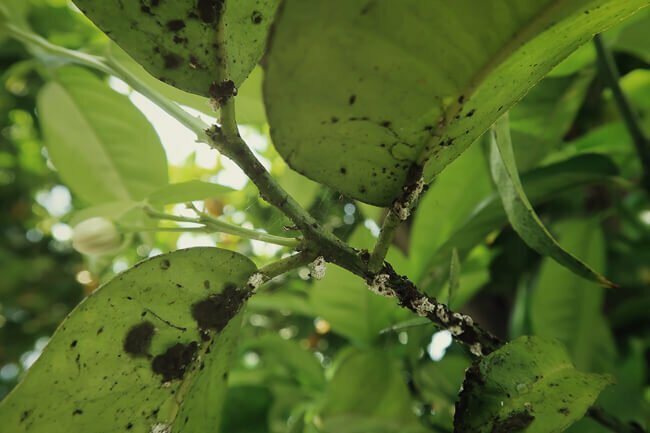 So as you may have guessed, sooty mould is a form of fungal disease that manifests by covering plant leaves and stems with a dark brown-black mantle of nastiness. The spores of the species Ascomycota fungi quickly propagate, causing quite a detrimental effect to a crop. As with all signs of distress, you should take countermeasures immediately. Though not the most common of mould attacks, it is an obvious sign of bug infestation. Theoretically, if you find yourself in the presence of this disease, chances are you neglected to inspect and discover an underlying pest problem. Luckily, this particular form of mould is relatively easy to contain and even eliminate. Bugs like aphids, whiteflies, mealybugs, leafhoppers, cochineals, and scale insects, among others, survive by munching on leaf sap. They bite and dig in, sucking out the plant’s juices. Like little vampires, they sink their teeth into the phloem, causing irreparable damage. The leaves will usually exhibit spots and stains, generally starting off silvery-white until necrosis sets in, turning the spots to yellow and eventually brown. Some insects may even inject toxins or viruses into the plant, causing systemic disease. 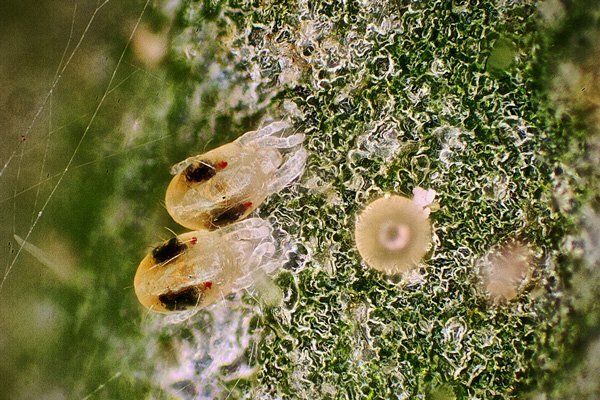 More often than not, they reproduce and deposit their eggs right on the undersides of leaves—usually starting out on the larger fan leaves. As bugs digest the sap, they will excrete honeydew. This is a very sticky, sugar-rich, golden-brown ooze that remains on the leaves. It is also the perfect food source for sooty mould spores. As the spores fly around in the air, they may get trapped in this insect goo. 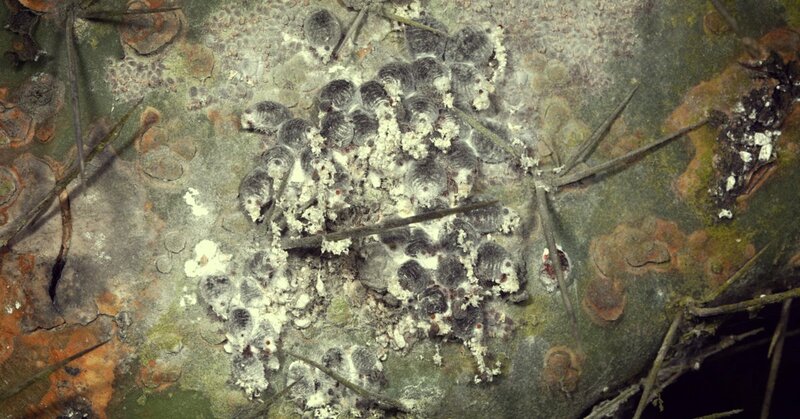 This insect excretion offers ideal conditions for apical elongation of the hyphae, meaning the mould starts spreading like wildfire in the presence of honeydew. As the disease spreads, it covers the leaves with its dark cape. Leaves are unable to photosynthesise, so there is no energy production. While not attacking the plant directly, indirectly, your crop may suffer from stunted growth and a weakened immune system. If by chance any of the bugs did inject your plants with a virus, you may be in serious trouble. Not only could you lose a crop, but it will also make cloning unviable. Sooty mould prefers indoor environments. The higher and stabler indoor temperatures make your secret garden the perfect haven for rapid and acute infestation. But as we have discussed before, sooty mould is secondary to an underlying bug problem. The same thing goes for bugs. Because indoor environments are less variable than outdoor plantations, if you form the ideal conditions for a particular species of insects to reproduce at scale, they will happily accept the invitation. There are no natural predators, and space is confined. Do your very best to inspect the plants thoroughly. A magnifying glass (better still, a 30x or 100x jeweller’s loupe) is your best friend, as many species of these honeydew-brewing organisms are almost invisible to the naked eye. Check the top, but especially the underside of the leaves for eggs. Follow the stems to the branch, and the main branches all the way down to the topsoil. The topsoil is also a favourite maternity ward for new eggs to hatch. Try your very best to find the evildoers, as the best thing to do is correctly identify which army of sap-sucking thugs you need to fend off. You have two options, depending on how severe the problem is. One is a milder organic approach, and the other is to use harsh chemicals. First, you need to eradicate the insect attack, and then you can proceed to remove the sooty mould. No one likes pesticides. They are mostly derived from crude oil, and while they may fix an immediate problem, they are hazardous to humans and nature in the long run. And if you are planning to smoke or consume your weed, you should do your very best to avoid using pesticides altogether. Even organic pesticides like neem oil may be harmful to humans. Having said this, it’s essential to understand how to apply them. If done correctly, they should not pose any problem. If done incorrectly, they could present a severe health risk. Extremely high doses of quick-release CO₂ are quite effective and leave zero residue behind. Unfortunately, it is costly to implement if you do not already own a high-quality CO₂ supplementation kit—not to mention the safety risk that comes with a CO₂-rich atmosphere. Portable UV lights can do wonders, but the power rating needed to be effective may also be costly. UV-C (467nm wavelength) is almost 100% effective against fly pupae, whereas UV-A (387nm) is only effective at 40%. But generally, these lights cover a broad spectrum, and studies have shown these lights can significantly reduce bug populations, particularly aphids. UV is also hazardous to humans and plants if exposed for too long. Neem oil is a classic foliar spray application against bugs. 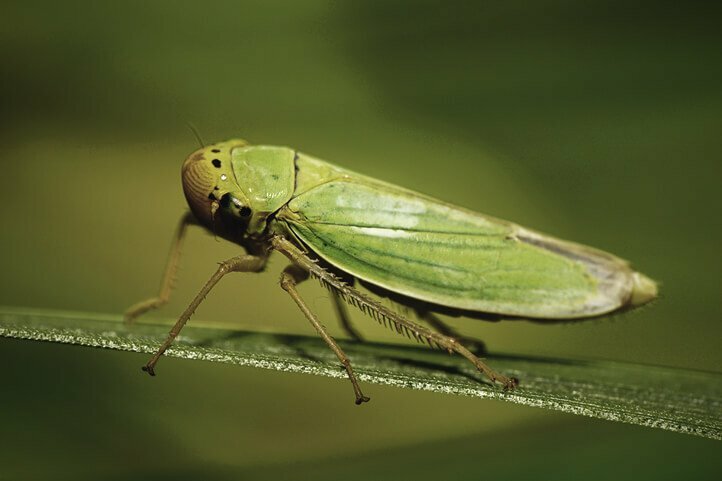 Particularly effective against leafhoppers, this all-natural remedy will leave a very foul taste and smell on your plants, so don’t think of spraying it on your buds—it will render them useless and even dangerous to smoke. Beneficial insects, like ladybugs, certain wasps, and lacewings can be quite effective. The problem is, for the most part you need to know how to take care of them, or they will die within a few days. You need to create a habitat for them, meaning you need to house and feed them or the population will quickly diminish. Spinosad products are derived from compounds found in the bacterial species Saccharopolyspora spinosa. They are considered safe and completely harmless to pets, children, and plants. They work wonders with leafhoppers, leaf miners, spider mites, mosquitos, fruit flies, and many others. Great as a prophylactic if you usually encounter pest problems. 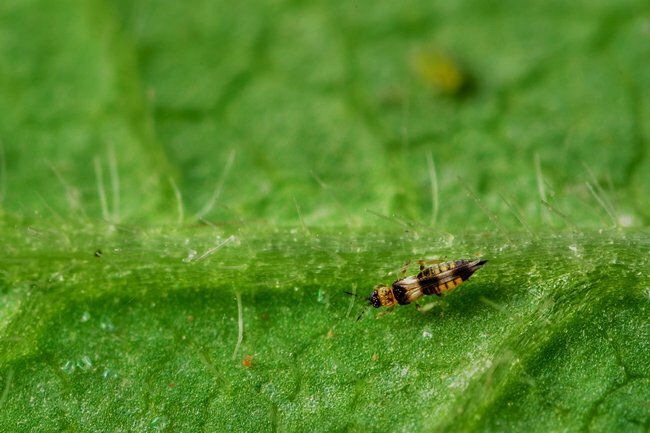 Insecticidal soaps (containing saponins) are another naturally derived form of bug control against aphids, mealybugs, spider mites, whiteflies, and others. They work by melting away the bugs' exoskeleton. They are considered safe for humans, but deadly to beneficial bugs. Soaps tend to wash off relatively easy, so numerous applications may be required. I HAVE A ZOMBIE APOCALYPSE INFESTATION ON MY WEED! If you have no choice but to drop a toxic bomb to control an insect outbreak, be sure to read the label and follow the instructions to the letter. There are thousands of products readily available in most garden centres, targeting specific classes of insects. So it is essential to know what you are dealing with before buying. It would be wise to apply as per instructions to one branch first and wait one or two days to check how the plant reacts. Some chemicals may trigger unwanted reactions, just like in humans. That is why the banning and recreation of petrochemical pesticides is such a vicious cycle. Authorities ban a substance, and the guys at the lab concoct the next-closest analogue that is unregulated. If there is no apparent sign of plant stress due to the spraying, then go ahead and eliminate the honeydew dwellers that are causing you nightmares. If by any chance the sprayed leaves suffer apparent symptoms (burning, clawing, wilting), then you’ll know you have to try another product. WHAT ABOUT THE SOOTY MOULD? This is the easiest part, really. As mentioned, sooty mould does not directly harm the plant. Source some form of biodegradable plant-safe soap, and prepare a sprayer. Just wipe off all the sooty mould and (mainly) the honeydew present on the leaves. This will be a long and tedious, yet imperative operation. Be gentle and do not rush it; honeydew is very icky-sticky stuff. A quick and strong wipe could snap a leaf off. The best tactic is to wash your plants from top to bottom with the product. It will start dissolving the honeydew and softening the mould. When it’s time to wipe, it should slide right off. In the end, you should rinse your plants with water to let the leaves breathe freely and allow light back in. You should now have a clean slate, and hopefully, a lesson learned. Continuous and thorough inspection of your plants is the best way to prevent bug infestations and therefore, sooty mould.